The Greater Kudu (Tragelaphus strepsiceros). Hundreds of stories have been written about this regal creature. I thought to myself that no hunting magazine would accept another article about Kudu. The articles are too common and readers get tired of reading the same old stories. So why would I pick this topic to write about? I guest because it was the most memorable hunt of my life. It was a hunt that touched every emotion in my body. Over the three days that I chased the gray ghost I was filled with great expectation, periods of extreme excitement, bone weary fatigue and even deep depression. This very special hunt is burnt into my memory and will always be there. Let me share it with you. Like most hunters who make there first trip to Africa, Kudu was on my mind. To me, it was the most impressive plains game animal on the Dark Continent. On my first safari, my son (Clay) and I hunted the bare desert wilderness around the Brandberg Mountain in Damaraland, Namibia. We were seeking Gemsbok, Springbok and Mountain Zebra which thrive in this unimaginably harsh environment. It was here that I saw my first living Kudu … a bull pushing 4 cows down a dry wash near the base of the mountain. He moved gracefully with his head held high and horns thrown back. My heart skipped a beat and I urged my PH to take me in closer. He sensed my excitement and suggested that we set and glass the bull for a while to gage his trophy status. After staring through his binoculars for what seemed a life time, he turned to me and said the bull needed another couple of years. I was crushed and wanted to say I don’t care. All I could do was watch this bull walk on as extreme disappointment settled in. Clay and I successfully took all of the animals on our hit list and I begrudgingly left Africa with thoughts of Kudu swimming in my mind. I knew I had to come back to chase the grey ghost. Two years later, my dream came true and I headed back to Africa. I was met at the Hosea Kutako International Airport in Windhoek, Namibia by Johann Veldsman, the owner of Shona Hunting Adventures. I had spoken to Johann about the obsession that I had developed and he assured me that we would take a good Kudu bull. His confidence reassured me and I set back and relaxed on the way to the lodge. At the time I had no idea how challenging this quest would be. Johann has a luxury bush camp (Omuzire) half way between the airport and the main lodge. He suggested that we spend a few days there to chase Warthogs and take a Gemsbok for camp food. After sighting in my rifle, we slowly drove around the property checking water holes for a trophy size pigs. While at the bush camp we saw Kudu … lots of them. 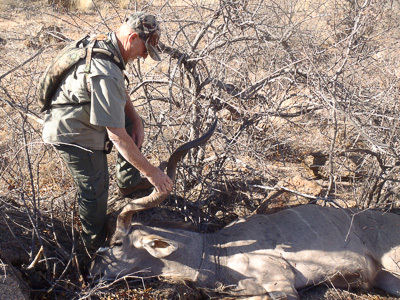 Johann told me that we would hunt for my Kudu bull at his Tualuka Safari Lodge property (further north), but that if we saw a bull at Omuzire with horns over 50-inches we would stop and plan a stalk. We saw many bulls sprouting horns in the high 40’s, a bull in the low 50’s with a broken horn and several with odd horn configurations, but no shooters. After taking my Warthog and culling a cow Gemsbok with a deformed horn that needed to be taken out of the gene pool, we moved on to the Lodge. The first afternoon at Tualuka (near Kamanjab) we drove the property to get used to the terrain. Johann used this time to give me an education on Kudu and the hunting methods used to take them. We saw over eighty Kudu within 4 miles as we drove down the Huab River drainage that the Lodge sets on. The bulls we saw were a picture of stately dignity. There movements were measured and regal, even when they ran off. Their huge horns further enhance the image. We saw bulls that we could have easily shot from the truck, but Johann does not condone that practice and only uses the vehicles to get into the general area to be hunted. It became apparent to me that Johann is a strong believer in fair chase hunting and does not get locked into horn measurements. Rather his focus is on taking old animals that are past their prime. I was impressed with his knowledge of the game animals in Namibia and his strong hunting ethic. I learned a lot about Kudu this first day at Tualuka. Johann and I had a lot in common and we bonded quickly and found ourselves laughing and joking on a continuous basis. I was looking forward to the next days hunting. Early the next morning we got serious and started to hunt Kudu in earnest. On the calendar we were moving into the full moon phase and a cold front moved in over night. The temperature dropped drastically and as we drove to where we wanted to hunt we noted that all the Kudu we had seen the day before were gone. They disappeared as quickly as light disappears when you hit a light switch. Over the next several days we searched everywhere. We checked water holes, glassed from the tops of every Koppie we came too, drove through the Mopani veldt and stalked through the Acacia groves without result. I was beginning to think that I might be making a third trip to Africa to find my bull. bedding on the eastern side of the slopes near dense cover where they could soak up the warmth of the morning sun. So we drove to a mountain some 4 or 5 miles from the lodge and looked for sign. At the head of a drawl we found Kudu tracks leading up the mountain. Many of the tracks were made by bulls. Johan said the drawl led to a large sheltered bowl. The trail was the only way in. He suspected that the bulls were using this remote bowl for cover during the day. With Johann’s Hunting Guide (Tjokkie Tjiveze), leading the way, we slowly advanced up the drawl, being careful not to kick any rocks. Halfway up the drawl we spooked a herd of Gemsbok. Fortunately they ran up the side of the draw rather than running up to the basin we were moving toward. As we got close to the top, Tjokkie lead us up the left side of the drawl to the basin rim. Here we split up to glass down into the bowl from several different locations. After a short while, I heard Tjokkie whistle. Johann and I moved to the sound and found Tjokkie hiding behind a very large boulder. He whispered that he saw a big Kudu bull on the far side of the basin. The three of us belly crawled up to the top of the boulder and peeked over. Johann asked me if I saw him. I stared in the direction that he was glassing and could not make him out. After glassing for some time I saw him. His grey color blended into brush perfectly. He was standing under a tree as still as a statue. I noticed that he was staring down his back track up the drawl. He seemed to know that if danger approached that it would come from that direction. Johann thought he would measure in the mid fifties. It was a beautiful bull with long, well proportioned horns that turned out on the ends. His horns were on the thin side and he had the look of a mature bull that had just reached his prime. He was standing over 400 yards away with a strong crosswind moving across his body from his rump to his head. To allow for the wind, I would have to aim behind his ribs. I did not want to attempt the shot. There was no way to approach him without being seen so we laid there and watched. Our hope was that he would eventually move down into the basin where we would get a better shot. I was afraid that it would take hours. After a few minutes, Tjokkie whistled again. He had spotted a second bull further down in the basin. This one was out of the wind and much closer. This bull was also standing broadside watching the drawl. His horns were shorter than the first bull, but he was still a keeper. This bull was about 300 yards away standing behind a large bush. I knew I couldn’t get a bullet through this thick, heavy limbed bush, but I lined up on him anyway and waited. He only needed to move forward 5 feet to clear the bush and offer me a shot. I was excited now and my dream of taking a nice Kudu big was now within reach. I had a good rest on the boulder we were laying on and with the scope turned up to 12 power, the cross hairs were resting solidly on the bull’s shoulder. Tjokkie was still glassing and softly whistled again. He whispered there was a third bull below us. Like the other 2 bulls, he was broadside and also staring down the drawl. He had heavy dark horns with worn ivory tips and was the largest bodied of the three bulls. Looking at his size and stature, he was obviously the king of the hill. He stood only 200 yards away and I had a clear shot with the exception of a wispy bush that covered his shoulder. I only need to shift my body a little forward and to the right to get my Remington 300 Ultra Mag pointed down. I moved as slow and as quietly as I could. This was not the time to make a mistake. One loose rock and all 3 bulls would disappear into the brush in a heartbeat. Once I got in position I heard Johann whisper, don’t worry about the bush, it too thin to deflect you bullet … then I heard him whisper with some authority …“shoot him.” I moved the cross hairs to the point of his shoulder gently squeezed the trigger. The rifle bucked hard and I lost sight of the bull for a second. When I caught sight of him again he was spinning around and had started to run. I was jacking a second round into the chamber when I saw the bull collapse into a brushy rock pile about 30 yards from where he was shot. The grey ghost was down! I watched the spot where he fell, ready to throw another 200 grain round, but all was still. In the excitement, I did not see where the other bulls ran too. I’d done it and found myself almost in a dream state, trying to comprehend what had just happened. It was hard to believe that we had pulled this off. Johann and Tjokkie were both grinning ear to ear. It had been a team effort and we were all proud of ourselves. It took us a while to climb down and get to the bull. As we approached there was no ground shrinkage. He was huge. From the wear on his teeth Johann guessed this old timer to be over 10 years old. After we located the bull, Johann cleared out the brush around the bull and the three of us rolled him up for pictures. Tjokkie then climbed back over the ridge to call the recovery team to come and help. The guys back at camp gathered up a tarp, their knives and water and drove out to meet us. They located our truck and hacked a road through the brush to get their truck to the head of the draw. They then hiked up the draw and went to work skinning and quartering the bull for removal. Johann carried the cape and horns out. He wanted to get the head back and salted as quick as possible. I was thinking ice cold beer. Back at camp, we relaxed and toasted to our success. The pressure was off my PH and the weather was warming. The next day we moved onto Shona’s hunting Concession bordering Etosha National Park. There I took a gold metal Blue Wildebeest and a very nice Red Hartebeest. But nothing could compare to our quest for the majestic Kudu. Unless lady luck is on your side, taking the elusive grey ghost is hard work, takes shooting skill, patience and perseverance. But the reward is worth it. God willing, I will go back to do it again. Don Roxby has over 50 years of hunting experience and has hunted extensively in the lower Untied States, Canada, and Alaska. Don has recently expanded his hunting activities to include Africa where he has become became afflicted with a severe case of Kudu fever.